10. Fun Chop – We ate dinner at Pei Wei the other night. Emmy loves using Fun Chop to help her hold chop sticks, and Lily insists on holding her chopsticks without it, so I always end up with one in my purse. What is a Fun Chop? It’s a plastic chop sticks holder that keeps them together so that all kids have to do is squeeze the chopsticks like a big pair of tweezers. Fun! 9. Chicago Wolves hockey cards – We went to a hockey game on Sunday, and everyone got a free pack of hockey cards! 8. My Nook – I normally don’t carry my Nook in my purse, but this afternoon I had my mammogram. I need something to read besides those outdated fashion magazines that hang out in medical facilities. Today I was reading Then I Became a Mother by Robin Kramer. Wait until you read my review later this month…it’s so good! 7. Spray hand sanitizer – no explanation needed! 6. My keys – with two beaded key chains that Lily and Emmy each made for me when they were in preschool. 5. My wallet – full of essentials. 4. Bubble Yum bubblegum, which Emmy insisted on buying during our trip to Target during Lily’s piano lesson. 3. Blistex and other lip balms and lip sticks, to make my lips pretty! 2. A small notebook and a pen – to write notes in at meetings or for blog posts, and to keep my children occupied if they get bored. 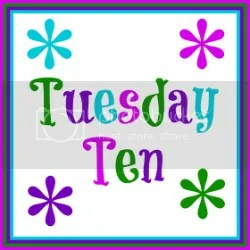 Tuesday Ten is hosted by Lisa from The Golden Spoons and Rabia from The Liebers, and they want to know what’s in your purse! What is the most unique item in your purse right now? “Assorted lip supplies” seem to be a common theme in people’s purses. My youngest son loves “stapstick” so he always has one in each pocket. Maybe I should get him a purse!! I don’t use a purse anymore. I only need my keys and my wallet. And they fit in my jacket pocket. The funchop sounds like a good idea. I never eat at a Chinese or Japanese restaurant (anymore), but chop sticks are a big no to me! Can’t handle them. At all!! What a great peek! I always carry Burts Bees lip balm. I have tried many brands, but the tinted is my favorite. Pretty wallet too BTW! Fun post! My Dad had a deal with a friend that no matter where they were if he gave her 50 cents he could dump the contents of her purse. Can’t go anywhere without my sanitizer! It that a Gigi Hill purse? That is my favorite pattern of theirs. I heard they went out of business. 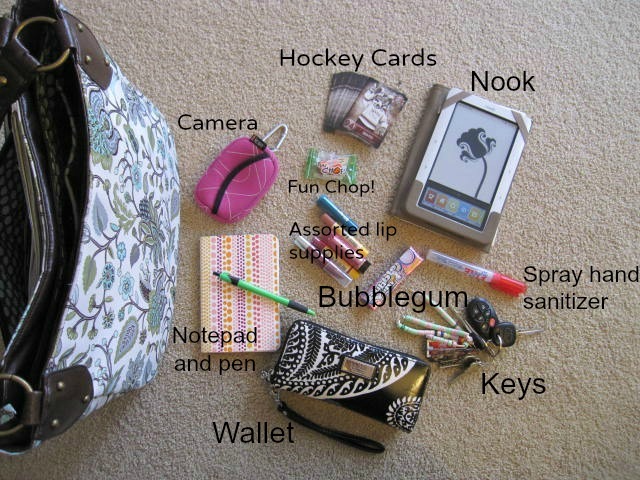 I’m with you on the big purse – mine is ridiculously huge because it’s a combination of diaper bag and teacher bag as well as purse! Nicole Hallford recently posted…In Which I Love All the Holidays! I don’t have to carry diapers, but I do use my purse to carry books to read to my preschool students! I love it! I think our purses have fairly similar things – except I don’t have playing cards or a chopsticks thing. Those are cards of all the hockey players on the Wolves team, kind of like baseball cards–I’d rather have playing cards! These will probably end up in the recycling bin! My tube was a freebie from the fire department’s open house…it probably doesn’t kill Norovirus. But it’s handy any way! It is really a great book! Robin is such a good writer. Love it! I have more than ten things in my purse, too. I’ve read Robin’s book and it is wonderful!